Knife in the Water was Roman Polanski’s debut feature film and yet it looks and feels like it has been made by a consummate professional. Its economic use of style and dialogue gives the film a sparsity which allows the narrative to unfold naturally; it doesn’t have to resort to time-saving contrivances and enables the relationship between its three lead characters to develop in a gradual and realistic way. 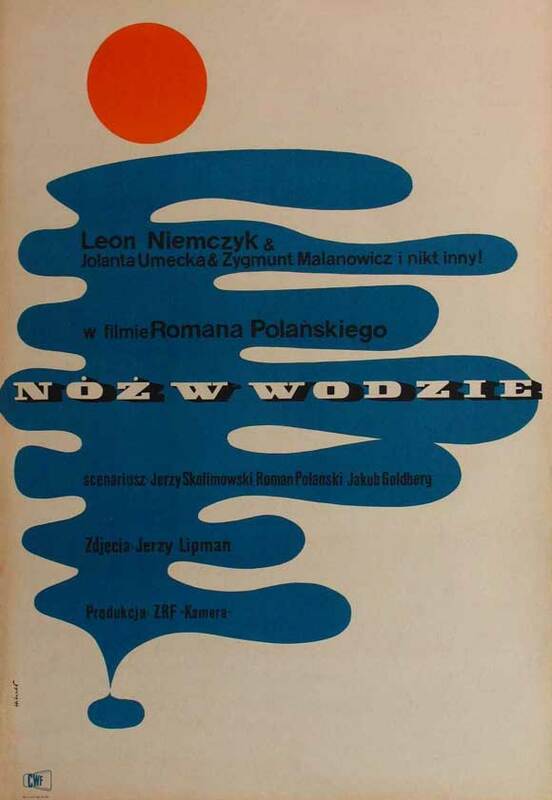 But make no mistake, its sparsity and slow burning narrative does not equate to it being idle, for this is an urgent film where every line of dialogue articulates the tensions and violence between Poland’s generation gap during the early 60’s. One of Knife in the Water‘s greatest strengths is how tightly it frames this narrative. There is no wasted space; each shot feels carefully considered and every line of dialogue seems to have been through the grinder to have become as effective at building character and developing tension as possible without once sacrificing the naturalistic integrity that infuses the film. Out of the three cast members only Leon Niemczyk (the older man) was a professional actor at the time of shooting, however this isn’t apparent during the course of the film. Zygmunt Malanowicz (the younger man) not only holds his own against the experienced actor but impresses with a subtlety and control that suggests he had been trained for some time. Similarly the sexual tension between the younger man and Jolanta Umecka’s character is very well done; for most of the film it is only communicated in small gestures and postures, and it’s even more impressive when you know this was pulled off by two inexperienced actors. There’s little to really criticise here; perhaps Umecka could have been more fluid and at ease in front of the camera at times, but her awkwardness on screen actually adds tremendously to her character and the themes at play so in a roundabout way it sort of works. This is an intelligent, taunt and affecting drama which lingers in the mind for quite some time afterwards. Frankly it makes for a hell of a debut. However Knife in the Water should not only be seen because of its status in film history as Polanski’s first foray into directing feature films but also because it very much stands on its own merits. It’s a powerful trip into the past that not only explores a period in Polish history but provides a more general look at the distance and resentment which so often builds between generations. What is the film’s greatest strength? It’s restraint and subtlety. Its greatest weakness? I suppose it’s Umecka, but she’s no great burden. Would I see it again? Yes, absoloutley. I can’t wait to see it again. A great movie from one of the best!! Sure is! I was really impressed by it now that I’ve finally get around to seeing it!